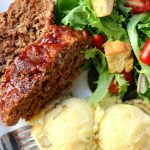 The best flavored meatloaf ever is cooked at the same time and in the same pressure cooker as your mashed potatoes. Add a tossed salad and you have a complete meal ready to go in just a few minutes. Wash the potatoes and cut them into quarters. Place them in the bottom of the Instant Pot. Add in the bay leaf, 1 tsp kosher salt and garlic cloves. Pour in the water. Place the trivet on top of the potatoes with the handles facing up. In a bowl combine the beef, garlic powder, worcestershire sauce, egg, 1/2 tsp kosher salt, black pepper, bread crumbs, bbq sauce and bacon. Use your clean or gloved hands to mix thoroughly. On the top of a piece of non-stick foil form the meat mixture into a oblong shape that will fit inside your Instant Pot. Carefully transfer the foil and the meatloaf on top of the trivet. Cover and secure the lid and press the manual button. Set the timer for 20 minutes on high pressure. The valve should be set to sealing. When the timer goes off do a quick release by moving the valved to venting. Open the lid and lift the foil and place on a pan. Baste the top of the meatloaf with bbq sauce and place under the broiler in your oven for 2 minutes. Remove the trivet. Discard the bay leaf. Drain all the water out of the pot. Add in the butter, sour cream and milk. Mash the potatoes with a potato masher. Salt and pepper to taste. Slice the meatloaf and serve with the potatoes. *I made this once with beef and once with ground turkey. I definitely like the beef better but the ground turkey was also good. I used my 6 quart Instant Pot Duo 60 7 in 1 for this recipe.